Reaching across multiple eras, 2016-17 Leaf ITG Heroes & Prospects Hockey brings collectors all-time greats and young studs in one release. The hit-only In The Game product delivers 15 autographs or relics in every box. This is a fairly substantial increase from the 10 hits per box in the 2015-16 set. Focusing on the future, the 2016-17 Leaf ITG Heroes & Prospects Hockey checklist includes Prospect Signatures for top up-and-coming players like Nolan Patrick. 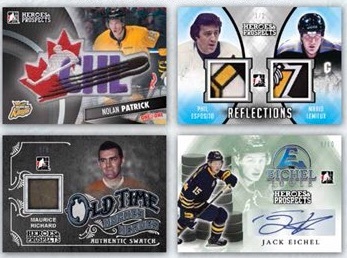 International Ice puts the signature spotlight on the global standouts, while Eichel Tower features the Buffalo Sabres' franchise player with four different signed cards. Mixing several CHL autographs in one set, the multi-player Stars of the OHL, QMJHL and WHL trio inserts utilize a star-filled design. Also promising multiple relic inserts, 2016-17 Leaf ITG Heroes & Prospects Hockey includes Heroes Memorabilia cards for current and retired players, and Old Time Hockey Heroes, which covers the former greats. Reflections works with a dual-relic layout that analyzes the similarities of elite players from different time periods. Increasing the number to eight relics per card, Heroes 8 is only for the legends. Full short print details will be added if provided. Bronze Short Prints: MSP = Mega Short Print, SSP = Super Short Print, SP = Short Print. PARALLEL CARDS: Red #/35 or less, Emerald #/15 or less, Purple #/10 or less, Silver #/5 or less, Gold 1/1, Printing Plates 1/1. Platinum Short Prints: MSP = Mega Short Print, SSP = Super Short Print, SP = Short Print. 49 cards. Serial numbered 1/1. PARALLEL CARDS: Platinum #/25, Red #/15, Emerald #/10, Purple #/5, Silver #/3, Gold 1/1, Printing Plates 1/1. 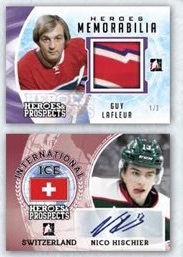 *Gretzky / Lafleur*: Platinum #/15, Red #/10, Emerald #/7 or #/5, Purple #/5 or #/3, Silver #/2, Gold 1/1, Printing Plates 1/1. 8 cards. Serial numbered #/35. PARALLEL CARDS: Platinum #/20, Red #/10, Emerald #/5, Purple #/3, Silver #/2, Gold 1/1, Printing Plates 1/1. Bronze / Platinum Short Prints: MSP = Mega Short Print, SSP = Super Short Print, SP = Short Print. PARALLEL CARDS: Red #/15 or less, Emerald #/10 or less, Purple #/5 or less, Silver #/3 or #/2, Gold #/2 or 1/1, Printing Plates 1/1. PARALLEL CARDS: Platinum #/10 or less, Red #/5 or less, Emerald #/3 or less, Purple #/2 or 1/1, Silver 1/1, Gold 1/1, Printing Plates 1/1. PARALLEL CARD: Platinum #/25 or less, Red #/15 or less, Emerald #/5 or #/4, Purple #/3, Silver #/2, Gold 1/1, Printing Plates 1/1. PARALLEL CARDS: Red #/6 or #/5, Emerald #/4, Purple #/3, Silver #/2, Gold 1/1, Printing Plates 1/1. PARALLEL CARDS: Platinum, Red #/25, Emerald #/10, Purple #/5, Silver #/3, Gold 1/1, Printing Plates 1/1. I expected CHL memorabilia cards from a CHL licensed product – not the case. For NHL jersey cards I will buy NHL licensed product. autos are all CHL players but I think those who bought this in the past liked getting jersey patches from the CHL jersey logos many of which have really good logos with lots of colors and breaks – awesome looking patches… they completely removed the only reason to buy this product. sorry but I am done with this. Very Solid product. Bought a box for 150$ CAD and was more than happy with what I got. Great value!